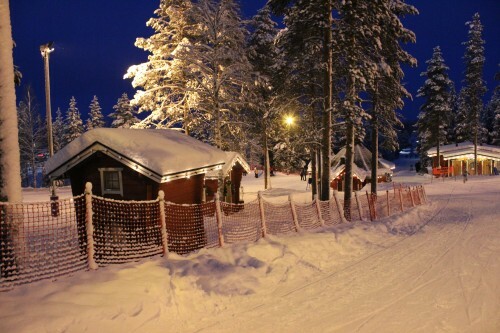 Want to experience a Lapland family holiday? Where snow is as sure as Santa arriving and where you can enjoy some skiing, reindeer rides and husky rides? Trying to avoid the big tour companies that charge an arm and a leg for the privilege? We tell you how to do it yourself and save money. 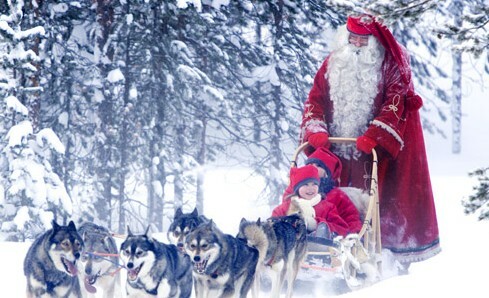 Ask anyone, if you want the magical and best white Christmas for your kids complete with Santa, a Lapland family holiday is the only place to go. And so, we knew we wanted to come to Finland for Christmas. But my searches were confusing, could we do it ourselves or did we have to go with one of the super expensive tour companies that arrange it all and you are rushed off your feet for days? We couldn’t afford the former and to be frank, I prefer to run my own schedule, to stay as long as I like at a place depending on if we kids like it or hate it. The idea of being moved on by an impatient tour guide trying to keep 40 families happy doesn’t appeal. And so, intent on finding a way to do it on a budget and after lots more research, I realised that we could do exactly what the tour companies were offering, for half the price and in a lot more comfort. DIY Lapland! For us there could be no discussion. It had to be for Christmas. We wanted white Christmas and that was that. But we discovered that spending the bulk of our holiday there in the week before Christmas was cheaper than going after and then leaving on the 28th December worked well and was most cost effective. By doing this we saved money on both flights and accommodation. It seemed like all the hype about Lapland and kids and Christmas centres on Rovaniemi, a town at the bottom of the area in Finland known as Lapland. There are lots of Santa themed activities there and where Santa’s ‘official’ post office is. 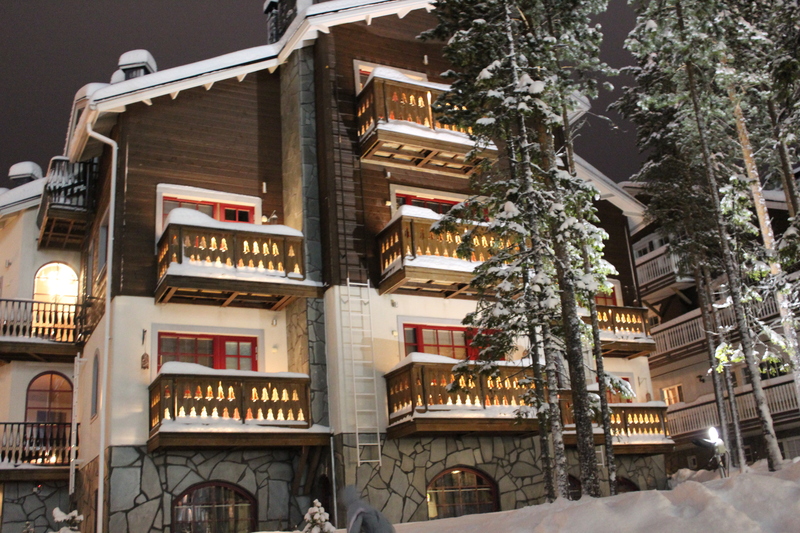 But it was more expensive than another option, a ski resort town called Levi. So we decided that we would do half our time in Levi and the other half in Rovaniemi. Levi has the advantage of being further north (therefore more snow) and also of having ski resort as well so that when you are sick of Christmas activities you can keep yourself busy skiing or sledding. It also has a free (yes COMPLETELY free!) area in the resort called Kidsland where anyone can ski for free without the need for lift passes. A real advantage for those with junior skiiers or very young kids. or for parents like me who are hopeless skiers! Finnair fly from many places all through Europe into Helsinki, Finland’s capital. From there it is another short flight to Rovaniemi or Levi – also on Finnair. We booked about 5 months in advance and picked up some pretty cheap sale fares. To me, Levi was complete, total and utter heaven. As soon as we arrived I felt as though we had been transported to a Christmas snow globe. The small village has all the amenities you need and the buildings are wooden and intricate with snow covered roofs. 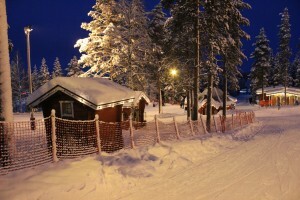 The endless night in Lapland in December means that everything feels magical and lit up all day! (Lapland has only about 3 hours of light as it is so far north – but don’t worry, you barely notice it as everything is lit up). We rented a self catering apartment which had three bedrooms and wonderful facilities. New and in excellent condition, we loved our nights in gazing out at the falling snow and watching people ski from our balcony. And no, it wasn’t expensive, it was actually cheaper than one of those small hotel rooms in that I was going to get through the tour companies. We shopped at the well stocked supermarket and cooked meals for ourselves most nights. Levi has a wonderful tourist office that can arrange all sorts of outings for you if you like. We arranged our husky ride through them, but booked ourselves the Reindeer ride, visited the Ice Hotel and saw the Northern Lights. 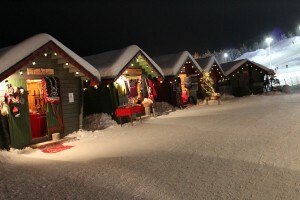 There were Christmas markets in quaint little red and green huts selling genuine Lappish made goods. Kidsland, Levi – the huts with toys and hot juice! We are not very advanced skiiers so I can’t give you much info about the advanced slopes at Levi Ski Resort. But Kidsland was just the most wonderful place. It’s free, and like everything else in Levi, incredibly beautiful. There are slopes for sledding where there are toboggans and other play things provided. 2 longer and slightly steeper slopes with lifts are also there and my boys had fun on both and I did too! They aren’t steep or in any way challenging but they are a great way to learn to ski and anyone is allowed on them. The best thing about Kidsland is the hut with a warm fire and hot juice to warm you up. They also want you to cook sausages in there and so utensils are provided to allow you to bring your sausages and buns to enjoy a hot dog for lunch. What bliss! Arranged activities occur twice a day (except Sundays) with the trained staff. They were great fun and the kids even won some prizes. We tried to teach the kids about the traditional Sami people who live in Lapland. We wondered how they survived before the days of high tech ski suits and thermal clothing. But we found that our visit to the Samiland exhibition was educational for adults but not that entertaining for kids unfortunately. We were so sad to leave Levi and wished we had arranged to stay there for all of our 10 days. So maybe our time in Rovaniemi was doomed the second we left Levi because anything would fall short in comparison to Levi! We didn’t find Rovaniemi as warm and village like as Levi. It was the day before Christmas and there was no-one around – in the place that is supposed to be Santa’s home! There were always people walking around Levi, the lovely central street always filled with people shopping or having coffee. Rovaniemi didn’t have that feel. But the reason we had come to Rovaniemi was to enjoy the sights it offered; Santa Park, Joulukka and slightly south, the Arctic Zoo. Rovaniemi is also harder to walk around than Levi as it is much bigger. We caught the bus to Santa Park and hired a car to drive to the Arctic Zoo – more details in my review. Anyway, we did enjoy our days in Rovaniemi, even if they weren’t as magical as our days in Levi. See my reviews linked above to see what is best for your family. DIY Northern lights – for less than half the price! 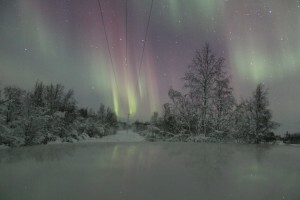 The Northern lights expeditions and tours are ludicrously expensive (about €140pp and €80per child!). I just couldn’t justify the cost. And so, when we were in Levi we decided to go it alone. There is a great website that tells you about the lights and the likelihood of them being seen. I watched it closely before we arrived and while we were in Levi and on the last night we were there the chances seemed good. I called Europcar and we hired a car for €100 for the night. We got it for a whole day so that also allowed us to drive out and see the Ice Hotel the following day – another big saving by avoiding the arranged tour price! The best time to see them is between 11pm to 2am. With kids this is not a great recipe for success if you don’t want grumpy kids the next day. So we put the kids to bed and then carried them sleeping into the car at 10pm when we headed out. Covered in numerous rugs, duvets and with pillows they slept through it all! We drove away about 1/2 hour away from Levi where there is no light pollution and after a couple of hours were thrilled to see the lights. What a wonderful experience and all for €100, not the €350 it was going to cost on an arranged tour. Plus we got to see the IceHotel, drive to the reindeer ride the next day and explore a few other close by villages! Easily the best €100 we spent all holiday! We stayed 10 days but I think 7-8 would have been fine as well. 10 days gave us an opportunity to have some time resting, to have a whole day tobogganing and throwing snowballs and enjoying our magical adventure together without the pressure of having to rush off to the next attraction. Also, the cold is intense. We had temperatures ranging between -10c down to -30c and after 10 days of that you are ready to warm up! Bring as many warm clothes as you can but most importunity some ski clothes for the kids which will act as their outer layer all holiday. Our kids just wore their normal clothes underneath and all in one snow (secondhand) suit that I bought them each. Good shoes are a must (invest in some that are rated to at least -20c – can pick them up for less than €40 with some smart shopping) and mittens (NOT gloves) for kids. Under the mittens buy a pair of gloves that help to keep them warm (ones that contain silver to conduct the body’s heat are sold in Finland and you can pick up a pair there for about €8). Also a balaclava style head protector for kids is important, make sure their chin and cheeks can be covered. 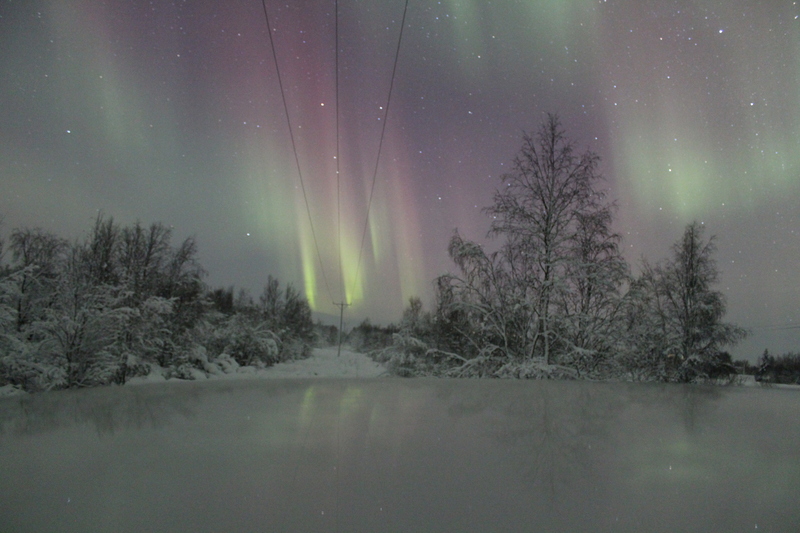 Without doubt, Lapland was one of the most wonderful places we have ever visited. It gave our kids and us a magical and the best white Christmas we could have imagined that we will treasure forever. But going it alone meant our credit card wasn’t battered and we saw and did more that we would have on an arranged tour. Heading to Finland? See all the reviews for attractions in Finland here.